CarGurus has 192 nationwide S7 listings starting at $27,975. To most Americans, a hatchback is a turnoff. For some reason we just don’t like the look, extra practicality, and extra space. If there is a single vehicle in the U.S. market that breaks that general rule, it's the 2016 Audi S7 Sportback. You see what Audi did there? The company acknowledged the car's novel body style, but gave it a name folks paying about $85K might prefer. For 2016, Audi makes substantive changes to the styling and mechanical bits of the S7, but retains its fantastic looks and practicality. Yes, we said fantastic. The 2016 Audi S7 is one of the few cars that actually looks better from the back. When it's at peace, the sloping trunk line that melts down over the rear fenders gives the S7 a unique look all its own. At speed, the active aerodynamics kick in, and a spoiler rises from the lip of the tail of the Sportback. Audi’s designers nailed this look. It does not have the inflated “pufferfish” look that some BMW sportbacks do. The S7 is one of the rare cars that has a look all its own, at least from the rear. From the front, it looks like an S6 sedan, or any Audi for that matter, which is to say mature and classy. The changes to the S7 mostly involve parts unrelated to its unique profile. Consider that great news. Audi likes its body-style changes to be almost transparent, and this 2016 update follows that plan. Up front, the headlights are all new and LED. The bold horizontal grille gets some updates that smooth out the design and improve it without letting you know it was changed. The trim around that grille can now be ordered in chrome or glossy black. In back the taillights are new, and a mesh bumper insert is added. The 2016 Audi S7’s drivetrain is updated, but not radically. The 4.0-liter turbocharged TFSI V8 engine has been retuned to 450 hp, a bump of 30 hp. Torque is unchanged, but at 406 lb-ft, still substantial. Making the most of the torque is Audi’s quattro all-wheel-drive system, standard on the S7. The S7 has its own dual-clutch transmission within the Audi A7 family. This means shifts are instant and rev-matched and selecting one’s gear ratios is easy and rewarding. The A7 and RS 7 use a conventional automatic. Steering feel, transmission shift points, and throttle response are all adjustable. In addition to your own “personal” setting, Audi’s pre-programmed modes include Dynamic, Comfort, and Auto. The interior of the 2016 Audi S7 is similar to other top-grade Audis, which means it's among the best in the world. The Audi man-machine-interface (MMI) is regarded as one of the easiest and best in the industry. The rotary knob that's your selector and mouse works well, but the smaller knob up and to the right of the main one is the real treat. It falls perfectly to hand and is the audio on/off and volume control. After a short time, it becomes intuitive and may be the only improvement over having that knob on the dash. The infotainment screen has been upgraded to a technology that improves movement viewed on the screen and offers a brighter display. The processor is also new, and it provides better functionality and speed. One new technology is the Corner View screen. This allows the driver to see what's approaching from the sides when exiting a parking space, and it works from both the front and rear. Night vision assistant helps spot people and animals ahead on the roadway farther than the eye can see. A head-up display is also available. Audi uses advanced levels of technology for its forward-collision prevention, dynamic cruise control, and lane-keeping assist. These enable the Audi to earn the IIHS Top Safety Pick Plus designation (when tested as the mechanically similar A6). Audi’s A6 also aced all its crash tests including the IIHS’ small frontal overlap test. Fuel economy is rated at 17 mpg city/27 highway/21 combined, and Audi recommends premium fuel. This is the only downside of a 450-hp V8 pushing a large car with all 4 wheels. Although mechanically almost identical to the 2016 Audi S6 sedan, the S7 offers a unique look most adore and much more practical storage space that’s easier to access. 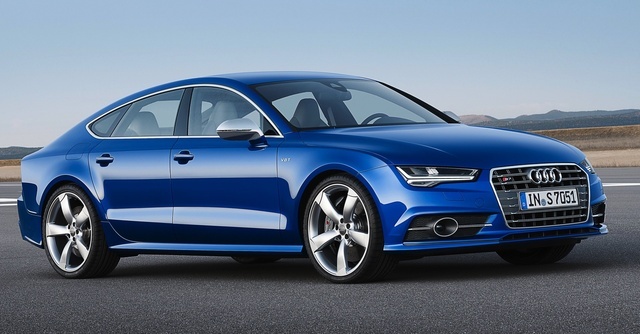 The S6 is less expensive, but the S7 offers style and practicality the S6 cannot match. What's your take on the 2016 Audi S7? Adam The 2016 S7 is an absolute beast on the road, with what can only be described as an angry, hungry and fidgety Siberian tiger under the hood. Handling is sublime for a car of this size, with interior appointments to match. It's a killer combo, and an amazing vehicle. Worth the price of admission. Have you driven a 2016 Audi S7?